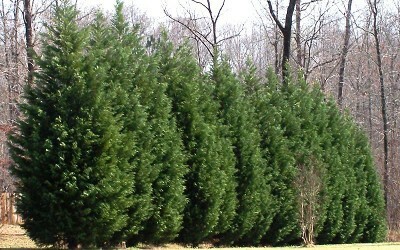 Leyland Cypress is often referred as leylandii and a fast-growing coniferous evergreen tree. This tree does well even in very poor conditions. It can grow up to 15 meters in 16 years. But it has been documented that the tallest leylandii is approximately 40 ft and still growing. This rapid growth is the one that attracts many people to grow this tree since it can offer some privacy. But the tree has undergone several classifications. Back in the past it was believed to belong in the genus Chamaecyparis but in 2002, it was classified in another genius which is Xantocyparis. Again in 2004 it was transferred to Callitropsis. But in 2006 all American species were transferred to cuppresus and this tree was among them. Since then several research has been made that has proven that this tree is a true cuppresus. This tree is tolerant to high levels of pollution as well as salt spray. It thrives in a variety of several soils and mostly grown in gardens. It also requires full sun for proper management. Most people grow it for shelter hedge due to its rapid growth. It may be used for screening but the major purpose for this tree is forestry. Leyland cypress has shallow roots which does not makes the large trees topple over. This status makes the leylandii not be able to adapt to areas with hot summers. In fact it develops cypress canker disease which is caused by a fungus when exposed to these hot conditions. This disease is very dangerous to leylandii because it kills it. When the disease attacks, it cannot live for more than ten years. However, when one tree has problem it cannot affect other trees. It is normally cut and another planted to replace it. Leylandii has been introduced to Kenya on parts of Mount Kenya.